Enjoy the freshest, best cup of coffee every time. Whip up restaurant quality, delectable brews at the touch of a button. Pour-over coffee allows more oils and aromatics to escape from the coffee, often encouraging a fuller-bodied blend with "higher" notes. The reusable 18/8 stainless steel filter eliminates paper waste, and its small size allows for smaller, fresher brews. With just a bit a practice, it will also allow you to fight crime, leap over tall buildings and detect life on other planets. Kidding! We kid! That last bit was not quite true. However, your Brewologist filter is a wonderfully portable device for camping or anytime you want to brew fresh, quality coffee on the go. I tried another type of pour over cone a couple years ago that used paper filters and it took forever to make coffee. This double layered all metal filter works much better. I find I need to grind the coffee a bit more than suggested but it makes great coffee and it makes it fast. I just started doing the "Pour Over Coffee" way of making coffee. My son had a plastic cone that used filters and I thought that the coffee that he made with that was good but then I saw this and thought I would give it a try. 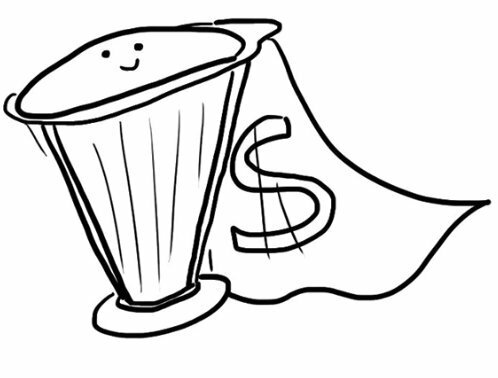 (I wanted to eliminate the step of buying and using the paper filters.) Amazing coffee with this filter! In fact, I just ordered another one today so that I would always have one ready to go! Thank you for this fine product! The large one can brew a carafe but you'd need to be careful not to allow water or coffee to overflow over the rim. Follow the directions to time the pour correctly for the best flavor bouquet. 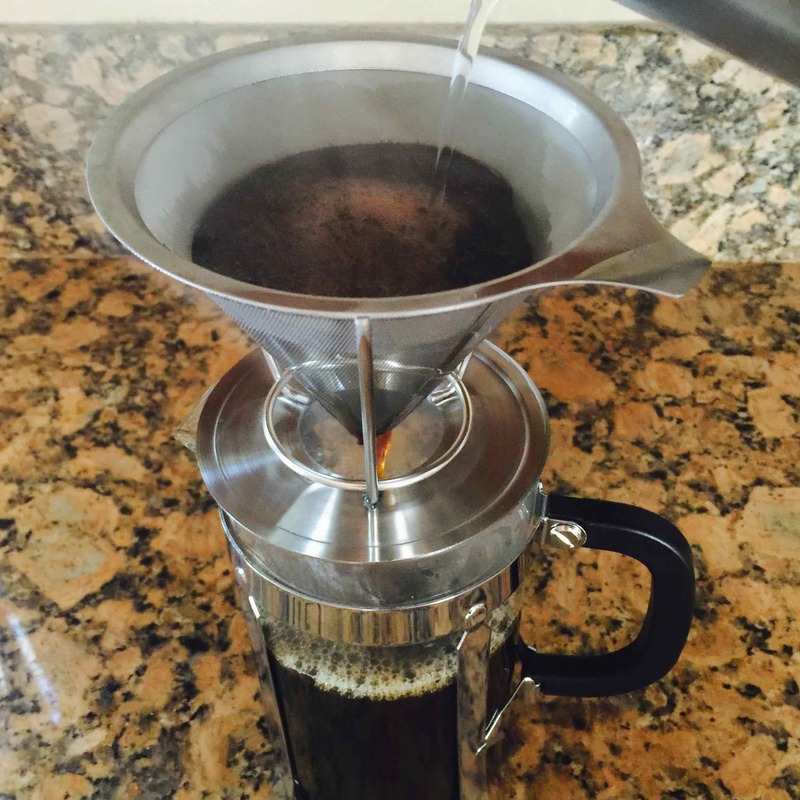 You will soon find out how much better coffee is with all the oils present in the flavor. Also you can use less coffee for more flavor. No waste and easy clean up. Couple extra steps vs a push button but no BPA plastic to ruin the flavor or give you estrogen mimicking hormones. Makes you feel like a "brewologist" too. More than anything this simplifies my coffee life! A quiet morning of me and my coffee. No plastic touching my coffee, no carafe or paper filters to worry about. And, because I make it one mug at a time, the coffee's always hot. I especially like the fact that the strainer part separates from the holder, which not all of these style pour-over cones do, and so there is less to break, crack, bend, and a bit less even to wash. Thanks for bringing simplicity back to my coffee morning, Brewologist. 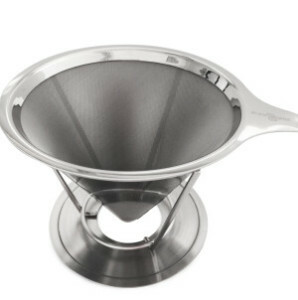 What a great idea, this pour over cone is stainless steel so doesn't get as mucky as plastic and it's easy to clean. 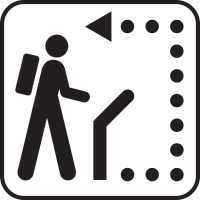 The construction is sturdy so it's a great option for travelers too. Worth the cost because it will last a long time and no paper cones needed anymore. 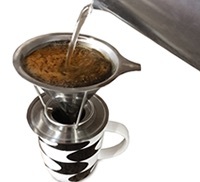 The pour over also makes a robust cup of coffee, you won't need to use more coffee to get a strong cup so we have actually been saving on coffee cost too. I was not expecting this product to be that different from any other filter/cone method of making a cup of coffee. But to my surprise, this filter really does make a much better cup of coffee. 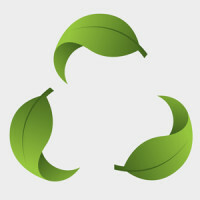 Easy to use, easy to clean, completely satisfied. Yes, this pour over filter delivers. I think it is even better than in in-store pour over at Starbucks. Kudos to Brewologist, they delivered, and I'm happy...finally. This product produces a deep, flavorful, and most of all -- SMOOTH-- deep bodied cup of coffee (that is not too bold), with acceptable hassle. Also, easy to clean. Therefore 5 stars. Before trying this product, I really tried so may different methods: regular brewed (to much time), K-cups (regular), K-cups (personal cup i.e. 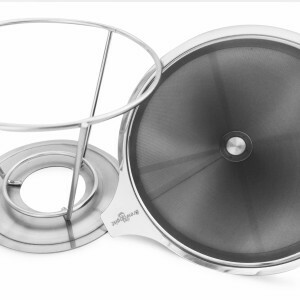 grind your own and put in with custom k-cup reusable filter), and regular filter with cone pour-over. Every other method had some drawback, mostly not enough flavor or too messy in the end. Transport yourself to a European cafe with the touch of a button. To match your Brewologist pour over coffee maker and all your chic kitchen appliances. Powerful 30W motor and power cord for maximum frothing and mixing action. 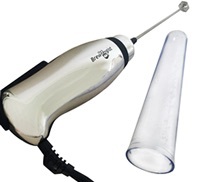 One touch button and extra long mixing wand. Clever cover is also a mixing cup. I have used many of these through the years. I used the battery operated ones and the 220V ones in Europe. This frother is better than the battery operated and better than many of the AC powered ones. If it was any better, it would compete with the ones used by coffee places. I purchased this in order to make Frappe and not as a milk frother. 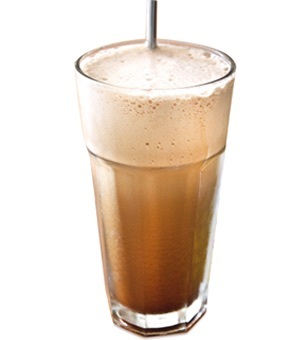 When you make Frappe, you "whip" the coffee and sugar in a splash of water and this will do an absolutely fantastic job. This motor does not have a lot of torque and if you are planning to use this as a milk frother trying to make foam in a full cup of milk, you would need to start close to the surface of the milk. The motor does slow down when it is submerged in liquid and then speeds up when the air (foam) is introduced to that liquid and it will keep introducing more air as it goes to full speed. Great for Frappe. I love it! I love this Turbo Milk Frother and Frappe Maker ( I no longer have to use sooo many AA batteries - it is electric ). I use it twice a day not to froth milk or cappuccino, I use it in my tea to mix the unflavored gelatin and honey - this can put a strain on the battery operated frother as the gelatin added with the honey thickens the tea but it does not seem to bog down the motor. 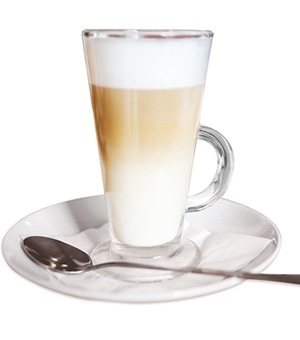 There is an upside in it for me as I've stopped so drinking cappuccino a few months ago and missed the froth on the top - it was so rich and creamy but I can get the same froth on my hot tea with this Frother. When I did it the first time I thought that it would be gone before I sat down to watch tv and enjoy but I was wrong it was still there all the way to the last drop which was that rich creamy froth. I am a happy camper now and don't miss my cappuccinos. 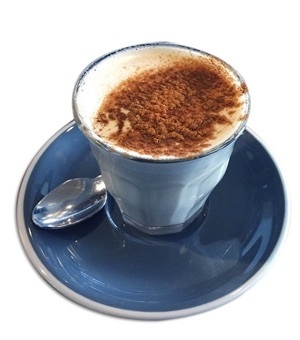 I love to start my day with a cappuccino. I have a simple espresso machine and the frother is basically useless. I purchased two different battery operated frothers and it seemed I was always changing the batteries. Added to this, the connections for the batteries were very flimsy. In short, it seemed every morning (as well as other times during the day) it was an adventure in frustration. 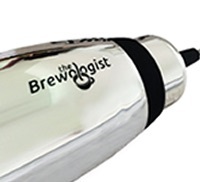 I saw this Brewologist Frother on Amazon and was immediately drawn to it because it was electric. I figured it was worth a try. I AM THRILLED! 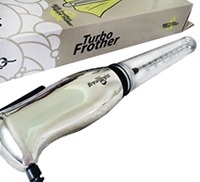 It froths beautifully, it runs at full power ALL the time, it is super easy to clean, it has a nice protective plastic cover for the wand (also a measuring tool) and it is attractive. 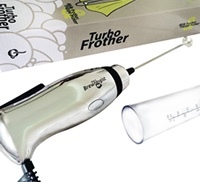 Yes, it is a bit bigger due to the cord and the frother itself but if you are a "battery operated, frustrated frother" like I was, this frother was made for you! Love this lititle gadget!!! Making a frappe has never been easier. What's even better is the costumer service, they have reached out to make sure I'm satisfied with it and adress any concerns.! UPC codes: RD-B2T9-XUSS: 4883543135066, BREW-4LARG: 4883543135653, 0B-7MQJ-5F1H: 4883543135271, 4N-5KGR-47UX: 4883543135264. 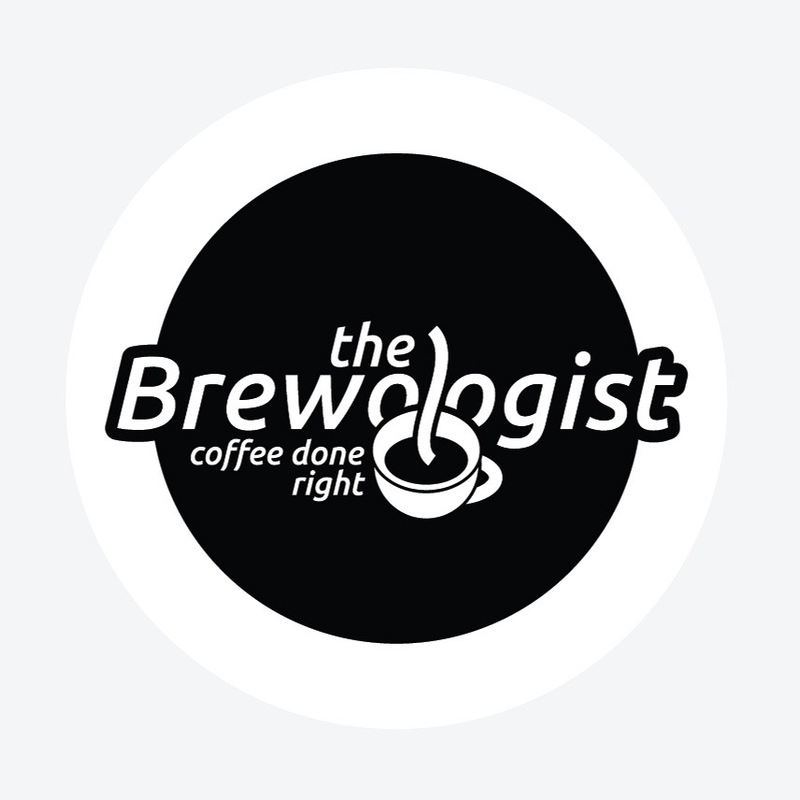 For support, please contact admin@thebrewologist.com and we will take awesome care of you. Happy Brewing!